From Goodreads ~ In a suburban Atlanta neighborhood where divorce is as rampant as kudzu, Mary Bliss McGowan doesn’t notice that her own marriage is in trouble until the summer night she finds a note from her husband, telling her he’s gone - and taken the family fortune with him. Stunned and humiliated, a desperate Mary Bliss, left behind with her seventeen-year-old daughter, Erin, and a mountain of debt, decides to salvage what’s left of her life by telling one little bitty lie. Mary Bliss’s formerly staid existence careens into overdrive as she copes with an oversexed teenager, a mother-in-law with Ethel Merman delusions and the sudden but delicious shock of finding herself pursued by two men: the next-door neighbor who’s looking for a suitable second wife and a dangerously attractive ex-cop who’s looking for the truth about Parker McGowan. All around her, couples are breaking up and Mary Bliss never expected it to happen to her. So you can imagine her surprise when she discovers that not only has her husband left her and disappeared but he has taken all their savings. She is in shock so at first tells everyone he is out of town working. But as she discovers just how dire her financial situation is, she has to come up with a plan and take drastic measures. In the meantime, Erin, her 17-year-old daughter, is out of control. Mary Bliss is still visiting Eula, her elderly mother-in-law, in the seniors home despite her being nasty and rude to her. Her best friend, Katharine, is bitter about her husband leaving her for a younger woman. I've read a few books by this author and I liked this one. I liked the writing style and found the storyline entertaining (it's a fun summer book). 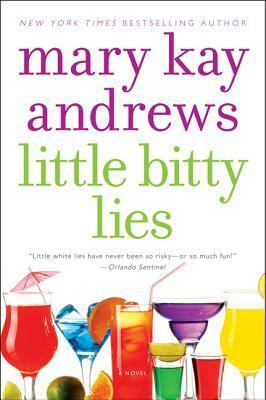 It is written in third person perspective focusing on Mary Bliss. I was surprised there was so much drinking and driving. As a head's up, there is swearing and adult activity. There is a recipe for the much talked-about chicken salad. I liked Mary Bliss. I know she had a lot going on but she needed to be firmer with Erin. Erin was so disrespectful to her and all Mary Bliss did was say she was grounded but she never backed it up. Erin treated Mary Bliss like crap and she allowed it. Some of the things happening in Erin's life were extreme and not necessary to the storyline and I could have done without. Even though she was not a nice woman, I found Eula amusing.